Keira — just your average young woman who’s suddenly transported to another world without even a change of clothes. Jason — her boyfriend, whose decision could tear them apart. Lord Charls — the Cordellan lord desperate to secure the precious resource that is lovelight. When Keira’s daily life becomes the stuff of legends, when rivals are readying for war, when she doesn’t know if she’ll ever get home to her own world . . . who can she trust? How will this affect her relationship with Jason? Integrating storytelling with love and light, The Cordello Quest is a fantasy-adventure suitable for open-minded readers aged Young Adult and upward. Stone circles, ancient symbols, crystals, natural magic, synchronicities, intuition, and friendship are gently woven into an absorbing journey of awakening. The Cordello Quest is book one of The Lazuli Portals Trilogy. 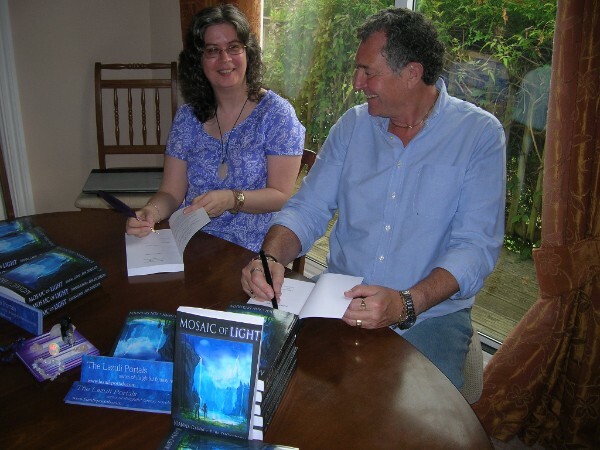 The second book of the series, Mosaic of Light, develops their ever-changing relationship. “As an adventure story this would be good but with the addition of the magical and metaphysical it becomes a great read. It is very clear from the writing that the authors have not only made up a captivating storyline but believe in the benefits and potential of lovelight in reality. “If you like your novels to have adventure, action, friendship, fantasy, metaphysics, magic & mystery, then this is a story you will love! Looking forward to reading part two – The Mosaic of Light. “Have just finished The Cordello Quest, absolutely absorbed me, i was taken on this journey and saddened when it came to an end.